The O’Brien, Prince of Thomond, Chief of the Name, The 18th Baron Inchiquin, 10th Baronet of Leamaneh – aka “The Great Condor” for flying, rather than driving, his Aston Martin. Conor Myles John O’Brien born in Surrey, England on 17th July 1943, the son of the youngest son of 15th Baron Inchiquin, The Hon. Fionn Myles Maryons O’Brien who married Josephine Bembaron in 1939. He has one sister, Fiona, who is married to Romano Obert de Thieusies. He became Chief and Peer on the death of his uncle Phaedrig, the 17th Baron on 20th May 1982. Conor was educated in England at Eton College, served in the British Army, 14th / 20th King’s Hussars in the Middle East, Far East and Europe from 1962 to 1975. He has lived and worked most of his life abroad, with 10 years spent in the Far East, Hong Kong and Singapore, running his own trading company for seven years, finally in Financial Services in Hong Kong before returning to live in Ireland in 1982. In 1988 he married Helen Farrell of Newtown Forbes, County Longford. They have two daughters, The Hon. Slaney O’Brien, born 1989 and The Hon. ​Lucia O’Brien born 1991. The family run an exclusive guest house in their home Thomond House at Dromoland, as well as having turned Dromoland Estate into a major sporting and leisure centre. Activities include, driven pheasant shooting, stalking, fishing, horse riding, eventing, hunter trials, clay pigeon shooting, archery and other activities. He is presently the Chairman Dromoland Development Company Limited and of an UK Development Company, Swift International Developments Limited. 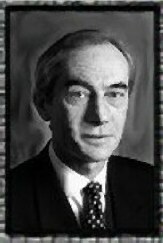 Conor O’Brien, as Chairman of “The Standing Council of Irish Chiefs and Chieftains”, is another Chief who believes there is a place for him in modern Irish life. He says, “with the tremendous interest in roots and Clans, the Irish Chiefs have a major role that they can play in the Gaelic and cultural heritage of Ireland and in helping the state authorities in the promotion of tourism through the medium of the Clan Associations and Clan Gatherings as well as ensuring that the country recognise the importance of the link between the old Gaelic culture and our modern day Republican culture. Conor is also an advisor to the making of the film “The Lion of Ireland” based on the best seller historical novel by Morgan Llywelyn. It is hoped that this film will be made in the next two years and the script by William O’Brien is presently being considered by a number of well known film directors. Conor was responsible for the formation of the O’Brien Clan Association and the First Clan Gathering for 400 years in 1992. He has formed “The O’Brien Clan Foundation” worldwide and this was launched in the USA on 17th March 1998. The latest Clan gathering was in Ireland at the Brian Boru Millennium Festival, 2002 in Killaloe, Co. Clare, to commemorate the 1000th Anniversary of the accession of Brian Boru to the throne of Ireland. His interests are in securing Dromoland Estate for the next generation, history, trees and wildlife as well as travel, skiing, shooting and motor cars. He is a member of the Kildare and University Club in Dublin. Celtic Lion, an emblem worn on King Brian's Ring. And although recorded the ring disapeared and was never found. 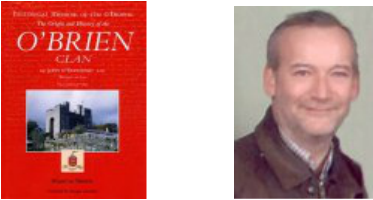 Martin Breen, publisher to the O'Brien clan Origin and History of the O'Brien Clan family books is a must for all O'Brien's everywhere.